Reading skills are one of the most important key qualifications for a successful education. However, after the access of new media has grown massively in recent years, educators and parents feared that children and young people will take advantage of these offers and reading will fall behind. This opinion, however, was now refuted by the JIM study by the Media Education Research Association Southwest (in Germany). The researchers compared the period from 2002 to 2014 and concluded that the reading behaviour indeed is subject to slight variations, but children and young people still read regularly: About 40 percent of all young people, outside of school responsibilities pick up a book several times a week, some even daily. Differences in the reading behaviour were only observed between boys and girls. While about half of the girls regularly read a book, in boys, however, it is only one out of four. For about 22% of all young people, reading is one of their daily pastime activities; while80 percent read at least occasionally a book. 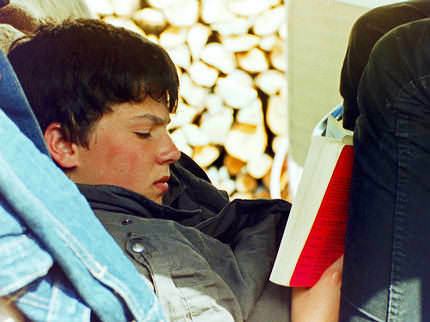 Only 19 percent of young people do not read, so the results of the JIM study. Striking is also that the proportion of non-readers in boys with 26 percent is significantly higher than in girls, where the figure is only eleven percent. Although there are no significant differences in the age bracket, according to the JIM study, however, notable is the proportion of non-readers in the 16 and 17 years bracket with 23 percent is at the highest. Although adolescents generally have a higher affinity for new media, this has little effect on their reading habits. Most teenagers give the classic book a preference to an e-book. Only five percent of young people regularly access an electronic book. However, there seems an age-trend to be emerging. While the age brackets 12 – 13-year-old ones seven percent read an e-book regularly, it is in the average young people only 3 percent. How long do young people read? In the current JIM study for 2014, they asked for the average reading time for the first time. Here you also see gender specific differences. Overall, young people read books for about 61 minutes daily. While girls read about 75 minutes per day, for boys it is only 48 minutes. For the latter, it seems, the time spent reading is on the decline. Therefore, in comparison with the last years, the reading period has dropped for about 8 minutes. The old saying that reading educates has not lost its validity in the 21st century. Educationally speaking, the active language acquisition is promoted by reading. This means that children who read a lot, have a larger vocabulary, and are also able to concentrate better, therefore, they develop greater social skills. As another positive aspect, reading promotes discernment and spiritual autonomy of the child. Probably the most important aspect, however, is that the child's imagination is stimulated by reading. After all, it does not get bombarded passively with images but has to assemble the words to pictures in his mind and also put the course of actions together by himself. This means that children who start reading early in life will amuse themselves excellently and won’t need an entertainer for their spare time. Even children and teenagers will appreciate the leisure without annoying commercial breaks. You decide how fast and how long you read. Therefore, you are not forced by a third party to read at a certain pace. Not to be underestimated is also the potential for savings. Books, for example, can be borrowed in a library, therefore reading is one of the most inexpensive leisure activities of all and not to forget, it can be exercised anywhere. What do girls read? What do guys read? That guys not only read less than girls but also prefer a different reading material has several reasons. They have significantly more female than male reading role models. Unconsciously guys put reading into the “girly” box and from a certain age on, that is a no-go zone. After all, reading is usually taken up by the mother and the female kindergarten teachers and teachers. When it comes to the selection of a school curriculum, teachers often meet not the taste of their students because they have their own ideas about what a good book is. Therefore, it often fails to awaken interest in reading in the first place. Another reason for a different reading behaviour is that guys usually have a much stronger interested for technology than girls. They devote their free time rather to the new media such as Gameboy, mobile phone or computer games than to books. In the case that boys do pick up books, they prefer to read adventure or fantasy stories, inform themselves about technical things, sports, and various games or prefer theoretical books about animals or nature. Partially the preferences of boys and girls are overlapping because girls also prefer fantasy stories. However, girls prefer to read about princesses, fairies, and mermaids while boys prefer fantasy adventure stories about aliens, monsters, dragons and wizards. Even with the fondness for animals and nature, the preferences overlap partially. Instead of technical things, girls prefer reading about creative crafts, styling, and social affairs. Promoting reading for children cannot start early enough. Therefore, even fathers should read to their children regularly. That models particularly to boys that reading can be attractive to men just as well. Once the children are too old for picture books, but not yet able to read themselves, comics are an ideal medium to introduce children to reading. For example, from all the Disney Comics numerous other adventures can be invented with children. There are many age-appropriate books, which are different to previous yeas do have an educational value. Latest in primary school, the interest in reading, should be further promoted. In order not to take the fun out of this pastime, there should be no forbidden literature, as long as it is age-appropriate. Because the greatest pleasure of reading results from the fact that you are reading about a theme that is fun already. We always used to have a good young people’s library in a cupboard. Everyone was able to borrow a book for 1-2 weeks. Mostly in November, at the end of the youth night, we would read for about 20-25 minutes a part of an ongoing story. The kids always looked forward to it. You might say, “Well back then ……” However, if you know how to read exciting stories, you still can do it today!